Today, the EPA released the Problem Formulation Document evaluating asbestos risk. Shockingly, yet predictable, the EPA’s evaluation excludes deadly asbestos legacy exposure and the Libby Amphibole from their risk review. 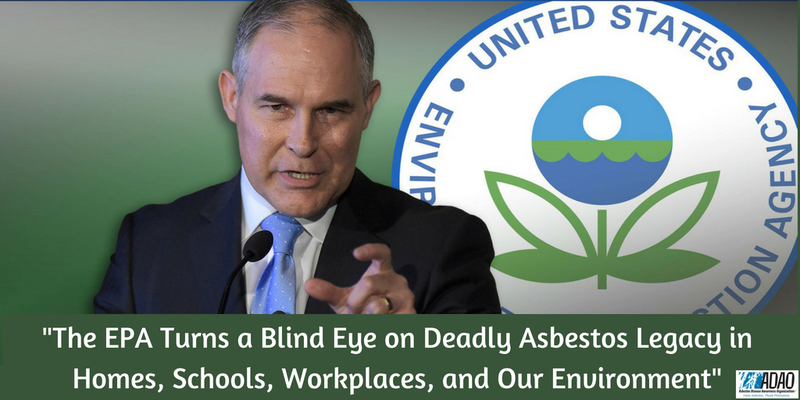 EPA Administrator Scott Pruitt adds to our outrage by stating “At the same time, we are moving forward to take important, unprecedented action on asbestos”, referring to a significant new use rule (SNUR) proposal. According to the EPA, the SNUR would enable the Agency to prevent new uses of asbestos. Quick question: Wouldn’t the best way to prevent new uses of asbestos be to have a complete ban of asbestos in the U.S.? The asbestos importers and users may see this as an initial win — but they are dead wrong. ADAO has built an arsenal of evidence in the EPA docket proving there is no safe or controlled use of this toxic chemical. Today’s release signals that the EPA has failed to implement TSCA reform and protect the American people. Many people already know how deadly asbestos is. Yet, unbelievably as it sounds, asbestos remains legal and lethal in the United States today. Two recent articles brought asbestos into the spotlight yet again, and in two drastically different settings — a prison hospital and a school. In both situations, public health was unjustly compromised as Americans were exposed to asbestos for years before being informed about the deadly carcinogen that was present. Asbestos is a deadly carcinogen, and there is no safe or controlled level of exposure. As the Acting U.S. Surgeon General Boris Lushniak said in 2016, “The asbestos issue is not a thing of the past. It continues to this day.” It is a current and deadly hazard in homes, schools, and workplaces today exposing both adults, and children to serious, and deadly health risks. The fact that we are seeing high levels of asbestos exposure in an elementary school is outrageous. The article states, “Asbestos fibers, which can be found in nearly all of the pre-1980 district schools, are hazardous when airborne… Asbestos fibers can be easily stirred up and linger in the air for hours or days in bustling school hallways and gymnasiums, or in classrooms where small children sit on the floor for story time.” Asbestos in schools is a prevalent theme in my blogs. In 2016, I wrote a piece for the Huffpost where I mentioned “if your kids are in an American school, public or private, they’re in an environment where asbestos exposure could become a viable threat if not properly managed or removed, and this is openly acknowledged by the U.S. government.” Two years later, this still remains true. Another recent article, “Cleanup at GA. prison hospital leads to yet another problem-asbestos” written by Danny Robbins at the Atlanta Journal Constitution, discussed the poor handling of an asbestos contamination when a former employee of the prison hospital had notified his superiors, as well as the government, of the concern of asbestos in his workplace environment. “Asbestos was among the concerns Dr. Timothy Young, a former physician of the prisons hospital, said he included in his complaints about the facility last year to the Occupational Safety and Health Administration (OSHA), the Environmental Protection Agency (EPA) and the National Institute for Occupational Safety and Health.” Even though Young expressed these concerns, the EPA was unresponsive. Similarly, the prison did not take serious and immediate action to remedy the extremely dangerous situation. The EPA and its leadership needs to step up and do their job to ban asbestos in the U.S. without any loopholes or exemptions. The ongoing deadly legacy exposures serve as a strong reminder that asbestos can’t be easily identified nor can the risk be managed. It is essential that we have prevention and enforceable policy to end the deadly asbestos man-made disaster. The “Assessing the Burden of Occupational Cancer in Canada” study reported that the cost of lung cancer and mesothelioma was an estimated $1,000,000 for each patient. In order for the EPA to fully evaluate the risk of asbestos, they can’t turn a blind eye to asbestos imports and use. They must recognize the deadly asbestos legacy in homes, schools, workplaces, and the environment. These two recent articles reaffirm that asbestos continues to pose a serious threat to Americans. The time is now to take action and stop the imports, dedicate resources to prevention, and invest in innovative technology as we begin to build a future free from asbestos. 1. Call EPA Pruitt at (202) 564–4700 and/or email Pruitt.Scott@EPA.gov to voice your opinion. 2. Sign the petition to ban asbestos without any loopholes or exemptions. 3. Join the conversation on social media by using the hashtag #ToxicEPA. A collaborative cancer prevention platform reporting on lifestyle, health, education, policy and community based efforts in cancer prevention cancer. The Less Cancer Journal is brought to you by Next Generation Choices Foundation, 501c3 more widely known as "Less Cancer".